Volcanoes hold a fascination for people. They are, at the same time, a portal to below the earth’s crust and a deadly, though beautiful, force of nature. These projects draw on the mystique of volcanoes to create stunning architecture and attractions. The Quzhou Sports Campus designed by MAD Architects, led by Ma Yansong, is a ground-breaking vision of modern design for the historic city of Quzhou, in China’s eastern coastal province of Zhejiang. 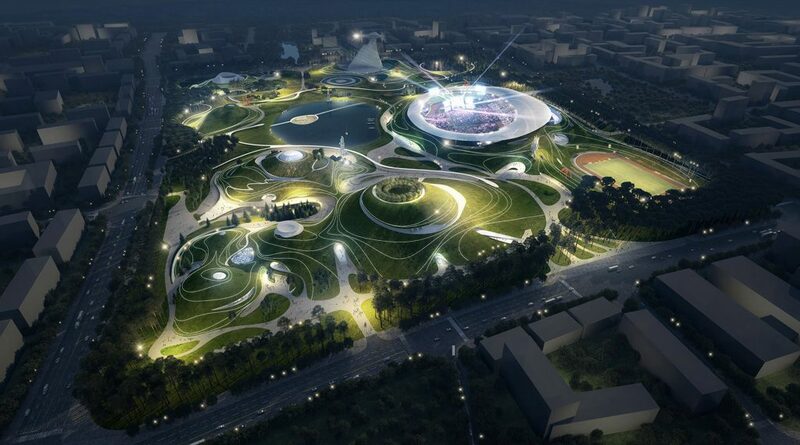 Spanning almost 700,000sq m, the first and second phase of the proposed national sports complex project has a total construction area of approximately 340,000sq m with MAD’s design embedding the functions of a sports park within natural forms to create an earth-art landscape in the centre of the city. Quzhou is a city with thousands of years of historical culture, while its natural landscapes are considered its most precious resources. With this in mind, MAD envisions a surreal, ethereal and tranquil artistic landscape in this modern city, like a mirage, that has the potential to become a place of spiritual belonging for the future of the city. Resembling a volcano’s crater, the main stadium sits into the ground, forming a deep space. It is crowned by a translucent ‘halo’ that gently hovers above the ground like a floating cloud. Its proximity to the earth makes it seem within reach – close but untouchable – inviting people to engage in a dialogue between the earth and the sky. Bee Breeders is a leading architecture competition organiser, which carries out fully inclusive organisation work for architecture projects and ideas competitions. This particular competition tasked participants to create a visitor observation platform for the top of Nemrut, a volcano in eastern Turkey. To sit at an altitude of 2,800 metres at the southern edge of the dormant volcano, the idea behind this new landmark is to provide unobstructed views across this extraordinary caldera and its internal lakes, as well as the immense Lake Van to the east. 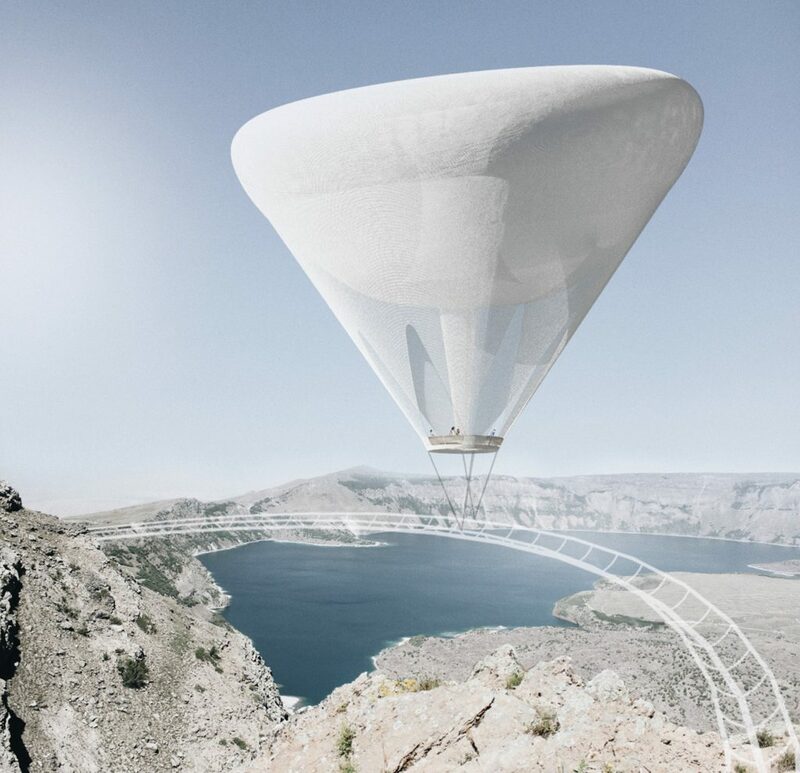 Student prize winners were Fernando Irizarry, Marcos Ortiz and Gabriel Rivera from the University of Puerto Rico with their Upservatory idea, which takes its cues from well-known ballooning sites over the vast Cappadocia in central Turkey. Their proposal is a mobile viewing station featuring a 20m²-circular platform suspended courtesy of an asymmetrical hot air balloon. The platform is accessed from an entry station near to the mountain’s ski lift and once elevated, the viewing station follows a guide rail cantilevered over the peak’s edge that allows visitors unrestricted views of the caldera and the surrounding geography. In a series of simple, captivating drawings, the submission succeeds in describing a completely new experience for observing the volcano. Vulcania is the European Park of Volcanism, an educational, French amusement parkland museum with a volcano theme situated in Saint-Ours Les Roches. 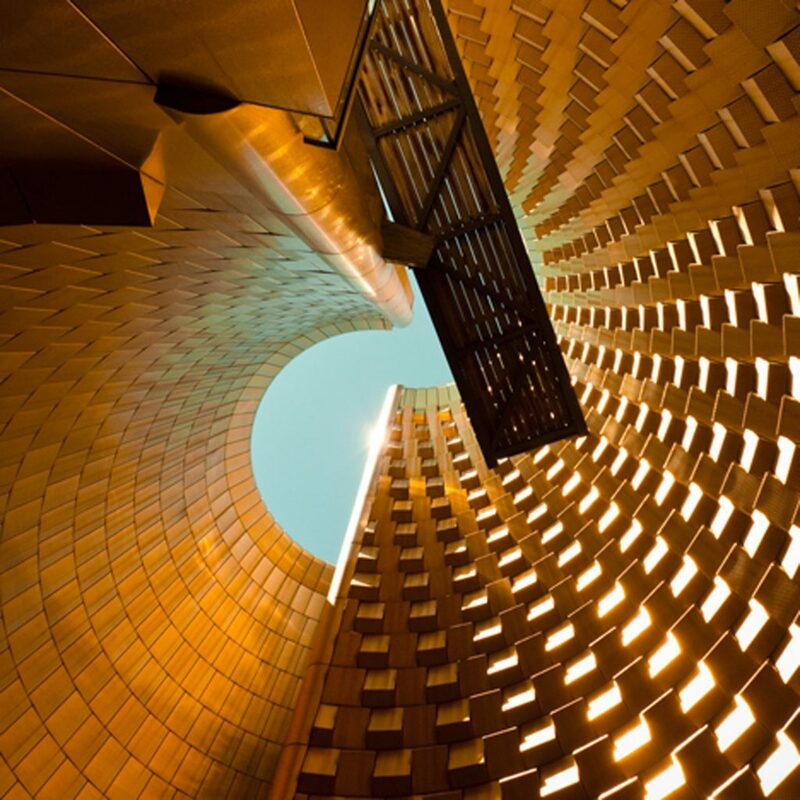 The architect behind the design of the park was Austrian modernist Hans Hollein. Three-quarters of the foundations are sunk underground, which aided in the rehabilitation of the land. Visitors approach a metaphorical volcano by descending down a ramp towards a cone-shaped structure clad in dark stone and lined in gold metal. At the heart of the complex is the bold form of a volcano, simplified to a geometric cone. Clad in slabs of solidified lava, its curving form is split to reveal a fiery gold interior and underground levels hosting eruption simulators, a rollercoaster and galleries.